How Does The 2019 Ford Raptor Stack Up To Santa's Sleigh? 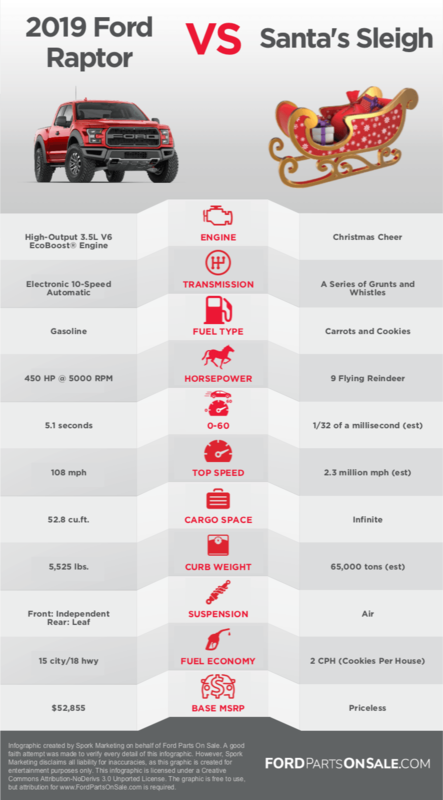 Have you ever wondered how one of the burliest trucks ever made, the 2019 Ford Raptor, stacks up against a mythical sleigh powered by nine flying reindeer? If so, Christmas has come early! Our team of researchers have combed through stacks of classified materials and schematics to uncover the hidden truths of Santa’s sleigh. Below is a side-by-side comparison of these two epic feats of engineering and magic. As you can see, Santa’s sleigh uses many unconventional, even supernatural, engineering techniques and alternative fuel sources to make it work. Whereas the 2019 Raptor is a bit more conventional, yet no less capable of handling whatever the holidays throw at it. Both vehicles are purpose-built and are sure to deliver the goods when the time comes. Happy Holidays from Ford Parts On Sale!